Running a lean logistics operation is a great goal. But, if you’re not careful, programs designed to increase efficiency can become weighed down with bureaucracy, adding time and cost to your efforts. A good example is Lean training. Training is crucial to getting your associates to focus on Lean practices. However, it’s equally critical for that training to stay practical and accessible, and therefore meaningful for people at all levels. Be careful of being overly academic. The goal is not to engage in a brilliant discussion of theory, but to have tasks and processes that can be easily grasped and executed while improving the overall result. “Content, level, and depth of training vary by the company and its needs, activity, and function,” says Tim McMahon, Founder and Contributor of A Lean Journey Blog. If in doubt, follow the original goals you identified when you decided to go Lean. “It goes back to the business case,” McMahon advises. Training is really the mechanism that delivers change by introducing new ideas and teaching staff to apply them to existing practices. But there are so many great ideas out there, choosing the right ones to introduce into your operations can be a bit daunting. Some companies go overboard and teach associates a myriad of problem-solving techniques. 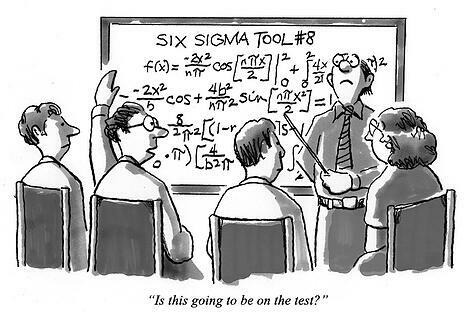 Six Sigma tools are a good example. There are hundreds available, from the “5 Why” root cause methodology to regression analysis. It’s best to zero in on just the few that work best for your company, and focus your training on the use of these specific tools. At the end of Lean training, everyone should know what Lean looks like, on an everyday basis. Lean should be more of a mindset than a theory. Outside consultants might be helpful, but they need to be vetted and managed carefully. A good consultant will constantly push your internal Lean leaders to break new ground, while leaving a wake of well-trained and fully-capable people using the Lean tools and teachings that have already been introduced. Focusing on people rather than practices is the smart way to go, according to an article in Smart Company about mistakes Lean Startups make. “By focusing on processes rather than accepting that a process is the sum of what people do, managers ignore their own employees and miss the most fundamental source of innovation and productivity: people’s smarts and initiative,” warn authors Michael Ballé and Daniel Jones. Lean training should be part of the ongoing process of going Lean, advises Jon Miller in his Six Sigma blog about common mistakes. “Too many months are spent in the ‘planning’ phase rather than trying something, learning from it, and adjusting the plan,” Miller says. Training should be a constant element in the process of transformation. Keep it practical and keep it simple. Your lean process should be a lean process. To learn more, check out our white paper – How Lean is Lean? – for a look at how bureaucracy can undermine the effectiveness of Lean logistics programs.